White balance is the tool to help get the colors in your images as accurate as possible. White balance setting is based on the color temperature while shooting and those color temperatures are measured in a Kelvin scale. Higher the temperature, more blue light exists and lowers the temperature, more red light exists. You can take an example of fire; lower temperature fire produces red flame whereas higher temperature fire produces blue flame. As a photographer it is important to know that any light below 4000k starts to appear as a red light and any light above 7000k or so starts appearing bluish. In photography, you have to understand that warmer light means red or yellow and cooler light means blue light. You have to judge the environment and lighting condition where you are shooting and adjust the white balance accordingly to get the nice and pleasant effects to your photographs. Nikon DSLRs come with the pretty standard predefined settings like Auto, Incandescent, Fluorescent, Direct Sunlight, Flash, Cloudy, Shade, Color temp and preset manual. Auto White Balance (AWB) works pretty well most of the time but sometime you need to change your settings to different available options. It's pretty easy to change the white balance option to one of the predefined settings. You just have to navigate through the white balance option from the menu button on the back of the camera (button location depends on your camera model) and select whatever value you want to set. If you are shooting under tungsten light bulb, you may want to change the white balance to Incandescent and if you are shooting outside, you may want to choose the direct sunlight and so on. If you want to set the custom White balance rather than what is already provided with your camera, you have an option in Nikon camera and it's called Preset Manual. If you scroll all the way down to the white balance setting, you will see the last option as a preset manual denoted by 'PRE'. If you have not setup custom white balance using the preset manual before, you will see bunch of blank memory slot denoted by d-0, d-1, and d-2 and so on. These are camera's memory slot to store the data from which it reads the white balance data if you choose to select the preset manual white balance instead of other predefined values we discussed earlier. Now let’s discuss how to set the custom white balance. How to set the Custom White balance using Preset Manual? 1. Set your camera into P, S, A or M mode. 2. Press and hold the WB (White Balance) button while rotating the rear command dial to select 'PRE' in the control panel and then release the WB button. When white balance is in 'PRE' mode, you can use front command dial to change the memory slot from d-0 to d-1, d-2 or others if you want. 3. Press and hold the WB button for few seconds again and you will see 'PRE' starts blinking on the top LCD screen. 4. While 'PRE' is blinking, take a shot of white or grey index card (Note: 'PRE' blinks about 10 seconds and you have to take a picture while it is blinking). 5. If the camera was successful to get the white balance data from your photographs, it will display 'Good' on the LCD screen and if not, it will display 'no Gd' and you have to try again with the proper exposure. 6. After you complete the process and set your custom white balance, your camera will take the reference of that image while applying the white balance to your shots unless you have set your white balance to some other settings than PRE. White Balance (WB) is the technique of managing colors in your picture. Unwanted colors which appears in the photograph are unpleasant and the process of removing or editing such insignificant colors is called the White Balance. White Balance is used to manage the color temperature, contrast, warmness of colors etc to get the real color tones. Digital cameras sometime get deceived with the light source and produces unpleasant photograph by mixing different colors in your photograph. Many photographers do not care about this option and they edit the colors during post-processing. But, in my view, its always worth to know about any technique that your camera has to offer so that you can apply it on the fly whenever you need it and probably save some editing time as well. The basic principle and the simple reason we adjust the white balance is to get the colors of the photograph as accurate as possible. Most of the time, Auto White Balance works perfectly. But in some cases, applying Auto White Balance may produce extra orange, green or blue colors in your photograph. When we see subject with a naked eye, we see it pretty normal but camera's sensors apply different color settings to the photograph based upon different light sources. For example fluorescent light affects photographs with blue color whereas tungsten light source (Incandescent/Bulb) produces yellow color in your photographs. We can correct this problem with the help of White Balancing technique. 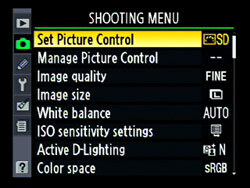 Today's advanced DSLR cameras have many more pre-defined White Balance settings. Nikon D90 also comes with many White Balance options such as Auto WB, Incandescent, Fluorescent, Direct sunlight, Flash, cloudy, Shade, Choose color temp or Preset Manual White Balance. You can choose different Balance techniques depending upon the light condition you are shooting at. Personally, I shoot RAW images if I doubt the lighting condition and then edit the White Balance later during post-processing. If you have a doubt on the given lighting condition, you may choose to shoot in a RAW Format and then edit those RAW images during post-processing. When you shoot picture in a RAW format, you will get the exact image taken by the camera's sensor without applying any adjustments like White Balance, Active D-lighting etc. In fact, camera will bypass all these settings and gives you RAW image. This is the beauty of shooting in a RAW format; let the camera take picture as it likes and edit them later on the computer. And just in case if you want to shoot in a JPEG Format to save some space on your camera memory or for any other reason, Auto White Balance does a pretty good job most of the time. You can always take a shot, preview it on the LCD screen, set the white balance to one of the available presets and take another shot again.